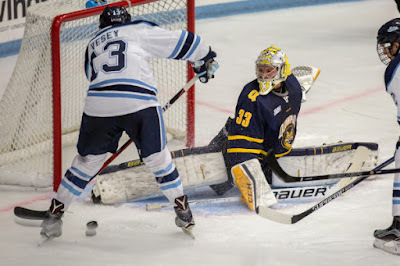 In a surprise move based on the timing, the New Haven Register's Chip Malafronte is reporting that Quinnipiac senior goaltender Chris Truehl has left the program after graduating from the university in May. However the BobcatsHockeyBlog has learned that Truehl's departure is due to him signing a professional contract in the near future but details are not yet known at this time. With rising sophomore goaltender Andrew Shortridge entrenched as the current number one and talented freshman Keith Petruzzelli, a third round draft pick of the Detroit Red Wings joining the program this fall, Truehl was likely going to be third on the team's depth chart which makes his departure less surprising. Truehl finished the 2016-17 10-8-2 with a 2.66 goals against average and an .899 save percentage in 21 games played with one shutout. He could head to another program as he still has a season of NCAA eligibility remaining. With the season getting underway in two months time the timing of this is not ideal and Quinnipiac should look to find a third goaltender in the juniors ranks that is willing to come in this season. The BobcatsHockeyBlog wishes Chris the best in his future endeavors and thanks you for your time at Quinnipiac the past two seasons. 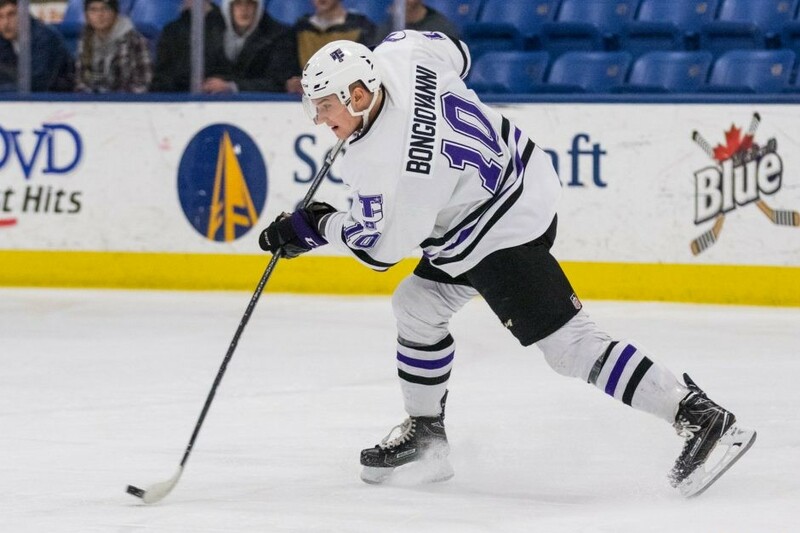 Quinnipiac recently picked a commitment for the 2018 season in Muskegon Lumberjacks forward Wyatt Bongiovanni, a Michigan native who was the 3rd overall pick in the 2015 USHL Phase I draft by the Des Moines Buccaneers. Bongiovanni made the USHL as a 16 year old which is an impressive feat to say the least. He finished his rookie season in 2015-16 with 14 points (3 goals, 11 assists) in 57 games for Des Moines. 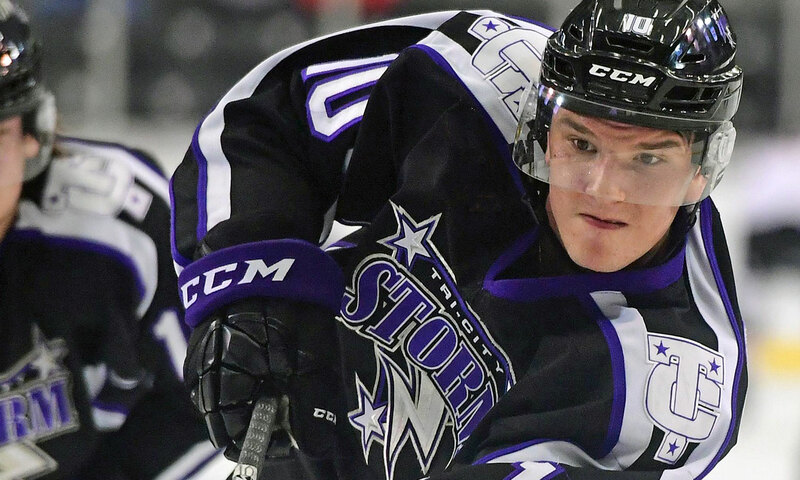 In 2016-17 he played for the Tri-City Storm and had 30 points (12 goals, 18 assists) in 59 games played. He was traded a few hours before the 2017 USHL Phase I draft along with two other players for a Phase II first round pick to the Muskegon Lumberjacks. Yet to fully blossom as a player, he is expected to be a key player for the Lumberjacks offense even after they also acquired Mathias Emilio Pettersen from Omaha for three draft picks. While Bongiovanni has yet to signed a national letter of intent, he plans to do so most likely in the fall signing period. I had a chance to catch up with him as he graciously gave me some of his time for a question and answer session so Bobcat Nation can get to know one of the incoming players for the 2018-19 season. Wyatt Bongiovanni: For me, the recruitment process took quite a while. I wanted to make sure I was deciding on the perfect school for me, somewhere I would love spending the next four years of my life at. When I visited Quinnipiac, I was very impressed with the school and program as a whole. The staff was spectacular and I felt extremely comfortable on the campus. On the hockey side of things, I wanted to play on a team with a winning mentality and I know Quinnipiac has that. I also want to get better as a player, and I know I will have a great opportunity to do so at Quinnipiac. With that being said, it was just a matter of saying yes to a school that I believed was a perfect fit for me. Jonathan Singer: When was the first time that the Quinnipiac staff reached out to you? Did they scout you last year when you played for Tri City? Wyatt Bongiovanni: I met coach [Joe] Dumais in Fargo, North Dakota in the middle of this past season and then they reached back out to me later at the end of the season. Jonathan Singer: What other NCAA schools had offered you a scholarship on top of Quinnipiac? Wyatt Bongiovanni: Without naming the schools directly out of respect for them, I will say I had offers from schools in the Big 10 and NCHC. Jonathan Singer: One thing that impresses me about you is you have 116 regular season games played in the USHL and you haven't turned 18 yet. Was it a big adjustment playing as a 16 yr old in the USHL which is not common outside of the developmental program and tenders? Wyatt Bongiovanni: It's always an adjustment when you're moving up a level, but I thought that I was physically and mentally prepared for the challenge. Jonathan Singer: Tell us about the type of player that Quinnipiac is getting? Wyatt Bongiovanni: The greatest players in the world play both ends of the ice along with playing hard and that's what I try to do. Jonathan Singer: What type of role does the Quinnipiac coaching staff envision for you when you arrive in the fall of 2018? Wyatt Bongiovanni: I think they, as well as myself, expect me to come in as a freshman, and be an impact player from day one. I want to be a reliable forward that can score. I'm confident in my abilities that I can do that for them. Jonathan Singer: With this being your first draft eligible season, did you take part in any NHL draft combine stuff or have any contact with teams even though you were not drafted this time around? Wyatt Bongiovanni: Unfortunately I did not have contact with any NHL teams this year. Jonathan Singer: Following up on not getting drafted in your first draft eligible season. Will you use that as a bit of motivation to get better in order to get drafted in 2018? Wyatt Bongiovanni: I think whenever things don't necessarily go your way you can use it as motivation, so absolutely. I still feel as if I have a lot to prove as a player. Jonathan Singer: You were recently traded to the Muskegon Lumberjacks. Are they expecting you to be a big contributor on offense with the departure of Andrei Svechnikov to the OHL? Wyatt Bongiovanni: Andrei is a special player, and what he did in Muskegon last year proved that. Of course expectations are high, but I'm prepared to fulfill them to the best of my ability. Jonathan Singer: What are the things you want to improve upon in your game in your final USHL season with Muskegon? Wyatt Bongiovanni: I have been working a lot on my skating this summer, so I'm looking forward to be able to separate myself from others with evasive speed and a powerful stride. Another thing I am working on is to improve on my scoring touch. Jonathan Singer: You played for some elite midget programs back in Michigan such as Honeybaked, Belle Tire and Little Caesars. How much do you think these top programs prepared you for this opportunity? Wyatt Bongiovanni: Those programs had a tremendous affect on my development at a young age. I was lucky to be surrounded by a lot of good players that helped me recognize goals that I still have today. Jonathan Singer: You had the honor of representing our country in the 2015 Five Nations tournament where the United States came in first place. What was the experience like wearing the red white and blue and how did this experience help turn you into the player you are today? Wyatt Bongiovanni: It was an honor representing our country in that tournament as it was an experience I will never forget. In a setting like that, when you have the best players in your age group joined together to make a team, you can build knowledge and learn from others, which is exactly what I did. Jonathan Singer: You were teammates with incoming Quinnipiac freshman Odeen Tufto for a short time after his trade to Tri City before he was traded again to Sioux City. What are your thoughts on him as a player? Wyatt Bongiovanni: Odeen and I sat next to each other in the locker room and we got along really well right off the bat. We built some chemistry in the short time he was there. He was one of my favorite line mates looking back on the year. He's a smart, quick, offensive minded player. I am excited to be able to play with him at Quinnipiac. Jonathan Singer: I think Tufto and yourself will have some of the best names in college hockey in the 2018 season. Wyatt Bongiovanni: Haha! I agree! The Quinnipiac Bobcats men's hockey team picked up a 2018 commitment from Muskegon Lumberjacks forward Wyatt Bongiovanni. The 6'0, 192 pound Bongiovanni is a left shot center that has already played 116 USHL games before turning 18. This past season with the Tri-City Storm, he had 30 points (12 goals, 18 assists) in 59 games played. He originally broke into the USHL with the Des Moines Buccaneers in the 2015-16 season where in 57 games with Des Moines he had 14 points (3 goals, 11 assists). A native of Birmingham, Michigan he was selected 3rd overall by Des Moines in the 2015 USHL Phase I draft. He was recently traded to the Muskegon Lumberjacks for the 2017-18 prior to the this years USHL draft. Bongiovanni is expected to be a big part of the Muskegon offense this coming season with the departure of Andrei Svechnikov to Barrie in the OHL.